David Carroll, PhD, researches alternative energy solutions, focusing primarily on quantum matrix composites. He and his research group, the Center for Nanotechnology and Molecular Materials, explore the properties and applications of nanomaterials, nanoparticle arrays and matrix nanocomposites. Carroll partners with industry to conduct contract and sponsored research, as well serving as a technical advisor. David Carroll, PhD, earned his doctorate in physics from Wesleyan University in 1993, after which he completed a postdoctoral fellowship in materials science and engineering at the University of Pennsylvania in 1995. He received additional training at the Max-Planck-Institut für Metallforschung (MPI) in Stuttgart, Germany. As faculty at Clemson University, he established the Laboratory for Nanotechnology. 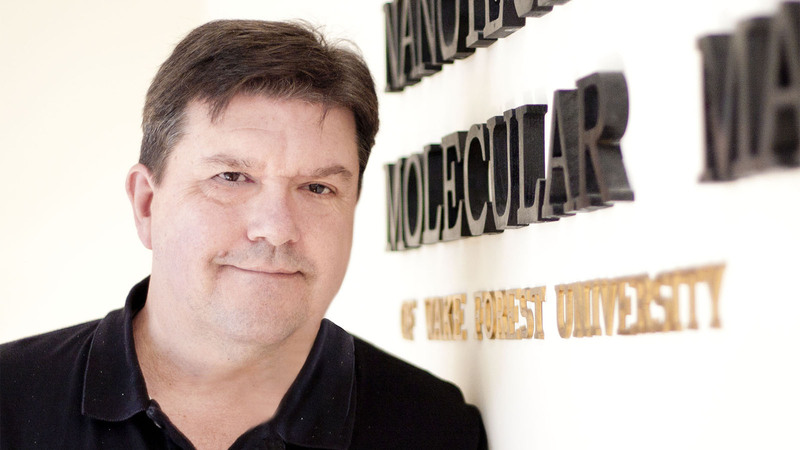 He moved this research group to Wake Forest University in 2003, renaming it the Center for Nanotechnology and Molecular Materials and expanded into biomedical nanotechnologies. A materials physicist by training, Carroll primarily researches quantum matrix composites. As an expert in alternative energy solutions, Carroll also researches nanocomposite-based display and lighting technologies, high efficiency nanocomposite photovoltaics, light emitting device technologies, solar device technologies and piezo- and thermoelectric generators. His other research interests include nanomaterials and medical nanosciences, including nanoengineered cancer therapeutics. Under David Carroll’s leadership, the researchers at the Center for Nanotechnology and Molecular Materials develop portfolios of innovative alternative energy solutions that include a thermoelectric fabric called Power Felt, field-induced polymer electroluminescent (FIPELTM) lights and the Hybrid Sterling Energy Generator (HySterE) solar panel. Carroll researches practical solutions to the energy crises that he sees facing the world. He believes that problems caused by global issues like carbon emissions, population growth and climate change can only be addressed by developing new technologies. The world needs a new way of looking at energy, and he and his research group embrace the challenge of developing a research foundation for this new perspective. Carroll believes that industry partnerships are essential to developing alternative energy technologies. Breakthroughs in energy research lead to disruptive technologies but require industry involvement to move into production and commercialization, where they make real-world impact. He works extensively with industry, conducting both contract and sponsored research with a range of companies of all sizes. He helped found several startup companies based on his research and serves as a technical advisor for other industry partners. Physicist David Carroll, PhD, illuminates the possibilities for alternative energy technologies created through industry and research collaborations. Levi-Polyachenko develops electrically conductive polymer nanoparticles and other polymer materials to treat cancer and other diseases, as well as for device applications.